string(1094) "Resource Centre > Uncategorized > 2017 Findings on the Worst Forms of Child Labor"
The Findings on the Worst Forms of Child Labor, mandated by the Trade and Development Act of 2000, is the most comprehensive research product on the state of child labor worldwide. This year, the report uses more stringent criteria to assess the efforts of 132 countries and territories to address child labor. Only 14 countries – including Colombia, Paraguay, and India – met the new criteria for “Significant Advancement,” which this year requires specific legal and policy labor standards to be met. Nearly two-thirds of the more than 1,700 suggested actions in this year’s findings report relate to the need to strengthen laws or improve the enforcement of such laws – highlighting the substantial gaps that remain worldwide. 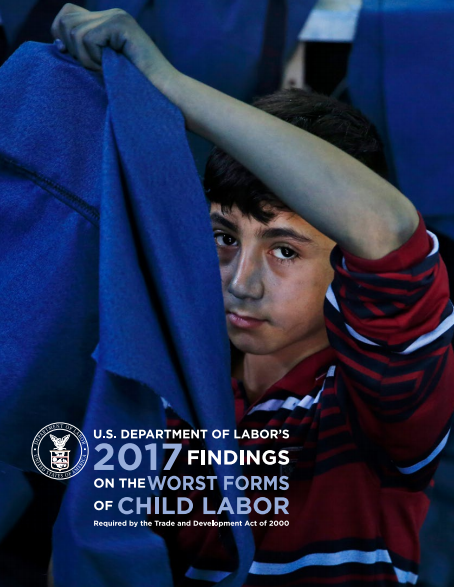 Similarly, the list identifies efforts made in select countries such as Paraguay, Brazil, and Uzbekistan, among others, to combat child labor and forced labor, and offers recommendations to countries seeking to end such practices.